my little red suitcase: booty! Yes that's right, car boot sale booty! This May Day in and amongst the gardening and mowing we went car-booting. The first of the year. I went with good intentions, unless of course I found a pile of lovely vintage fabric, I really wasn't interested! Not your usual kind of find really but sometimes you never know. I have been quite good of late. Mostly I'm trying to de-clutter. The stream of things going out has been quite good. Except for my recent thrifted suitcase, things have been quiet. It all started with these flowers. Please can somebody tell me their name?! 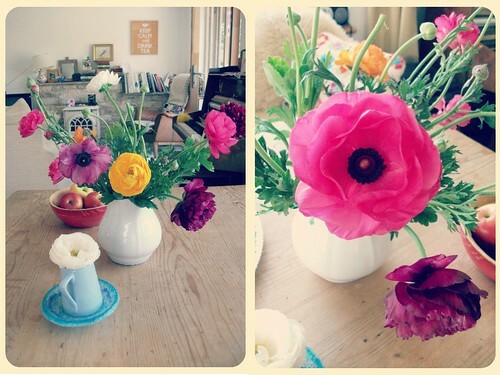 I feel a little silly not knowing, but I don't really buy a lot of cut flowers, other than the odd bunch of Daffs. These were so pretty and reasonable that I had to buy them. The pink flower is just so exquisite. 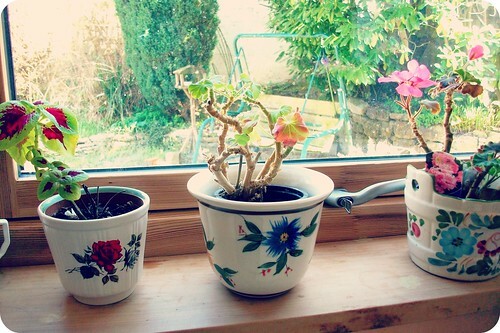 and then I found some well needed flower pots for my window sill. 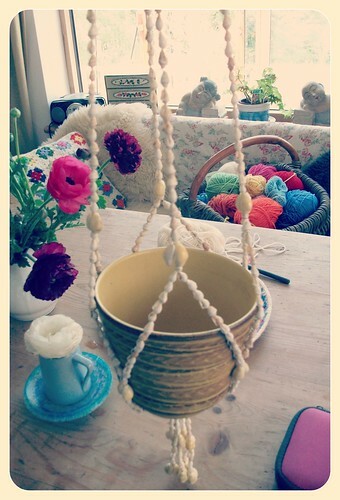 followed by this 70's shell hanging plant holder! and another very well matched pot from another stall. Are you sensing a theme here?! I love this, I'm now looking for a pretty leafy plant to sit in here. This tablecloth. I always buy these. Do you know if they have a name? 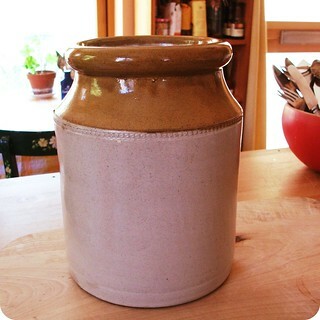 A stoneware pot, just right for my utensils. They don't fall over! Oh and five crochet cushion covers, 50p each! I know I could have left some for someone else, but I don't know what came over me! Several little tomato plants came home too. I have some simple plans for growing a few edible things this year. Like Rocket and Giant mustard leaves and maybe some Kale. I'm not going to go mad, but I do want to join in with the growing season. Will you go car-booting this year? They are great if you have younger children moving up through the different stages. Or will you be there selling things, or perhaps avoiding bringing home more things?! 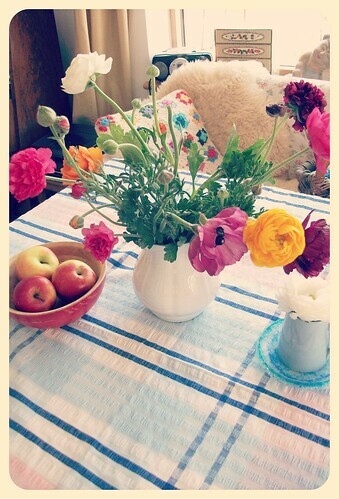 I think those flowers are rununculus, I dont think theyre anemones are they? No put me down for the rununculus! yes, that tablecloth is seersucker, and that stoneware pot looks just like the one my grandma had! love finds like these! Plant them in your garden, they're easy to grow and will make you very happy! I had them in many colors when I had a garden, they are beautiful and have long- lasting flowers you can cut and bring indoors, too! ... I'm dying to go to a car boot sale!!!!! Seersucker tablecloths are amazing, I haven't seen many of late and the last one I saw my mother in law beat me to it and it was a gorgeous lemon yellow and white. In glad to hear you are going to grow some of your own, it gets addictive. Your questions have already been answered Heather - and I agree - 'rununculus' and 'seersucker fabric'. I had a couple of tablecloths a while back exactly the same as that one, the second one had more pink in it, but sadly they eventually wore out! Such easy care fabric and so pretty. I love your new flower pots and cushion covers - they are so feminine and delicate aren't they. All the best with your growing projects - a very worthwhile activity! What a very lucky gal you were to find all these lovely stuff. I just love car booting its amazing what you can pick up. I really like the flowerpots and also your utensil pot (I could do with one if those). 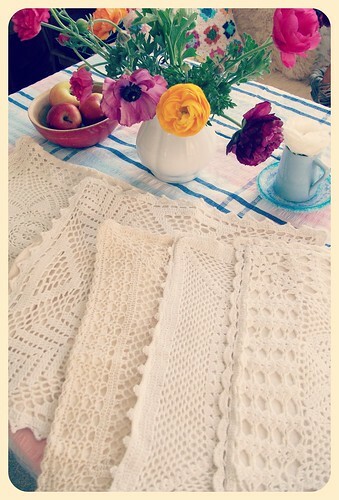 As for the crochet cushion covers you most certainly shouldn't have left then for anyone else they are just fabulous! !